If you enjoyed Richard Branson’s Losing My Virginity, Delivering Happiness by Tony Hsieh is worth a read. Delivering Happiness is the autobiography of Hsieh (pronounced Shay), who sold his first company to Microsoft for $265 million at age 24. He is now CEO of Zappos, the online shoe retailer that was acquired by Amazon in 2009 in a deal valued at over $1.2 billion. Not bad for a 35 year-old whose business ventures began at the age of nine with a worm farm. While I enjoy reading business books, when I started The Reading Experiment it was not my intention to review them. However, I really liked Hsieh’s story and he has some great life philosophies. Delivering Happiness doesn’t have the same level of glitz, glamour and adventure as Losing My Virginity. But Hsieh has the same entrepreneurial spirit and infectious enthusiasm as Branson and his journey to fame and fortune is equally remarkable – plus, Hsieh is an all-round nice guy. About halfway through, Hsieh explains the Zappos company values, its corporate culture (the company has been ranked 15th in Fortune magazine’s Best Companies to Work For list) and its obsession with customer service. This was my favourite part of the book. I also enjoyed Hsieh’s insights at the end of the book into what makes people happy. 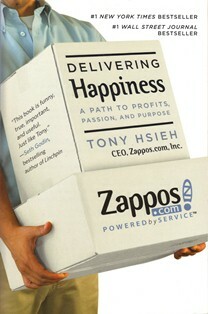 Would you like to read Delivering Happiness by Tony Hsieh? Thanks for reviewing this Louise, it is definitely going on my reading list this year. Maybe you could do a guest review of a business book on my site sometime? Thanks for the generous offer Shaun - I'd love to! I'll keep my eyes out for a good book and will be in touch. Cheers! Sounds good Louise, talk soon.